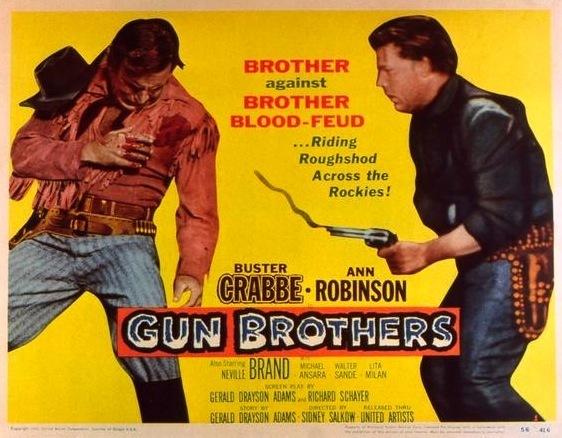 Cowboys On Demand | 50 Westerns From The 50s. 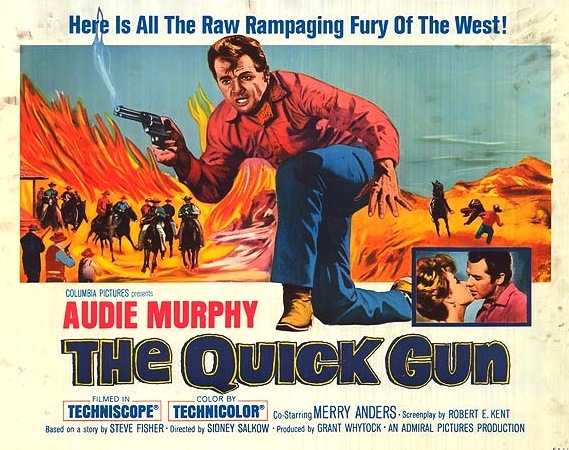 50s Westerns DVD(R) News #56: The Quick Gun (1964). It’s not a 50s Western, but it’s got Audie Murphy in it, which is close enough. Murphy was fighting the good fight well into the mid-60s, as The Quick Gun (1964) shows. You’ll find more details about the Columbia Classics release here. It was directed by Sidney Salkow and features James Best, Frank Ferguson, Ted De Corsia and Raymond Hatton (in one of the last of his nearly 500 pictures). Audie’s schoolteacher love interest is Merry Anders, who also played one of The Dalton Girls (1957, which is available from MGM’s MOD program). The Fred MacMurray Film Festival. 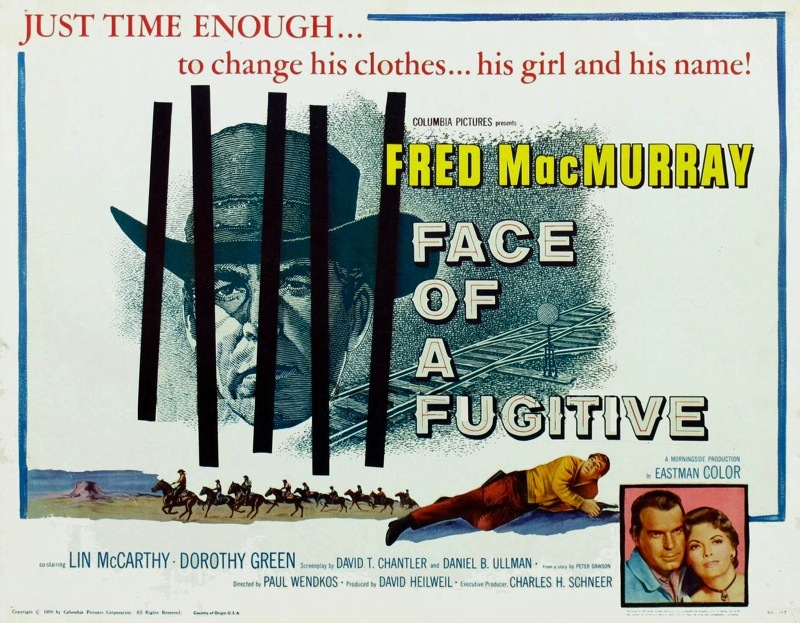 Came across a few Fred MacMurray Westerns on YouTube. I’m not a big fan of watching movies on the computer, since it’s a pretty lousy approximation of the theaterical experience. But these pictures are hard to see otherwise. Many of them were in CinemaScope and are presented pan-and-scan here, so beware. Face Of A Fugitive (1959) features an early role for James Coburn. A Columbia picure, it was 1.85 — so it looks OK on YouTube. Pretty good picture, too. Link here. Day Of The Badman (1958) from Universal-International gives MacMurray a fabulous cast to work with: Joan Weldon, Skip Homeier, Marie Windsor, Lee Van Cleef, Edgar Buchanan and more. It was in Eastman Color and CinemaScope. Watch it, or about half its width, here. 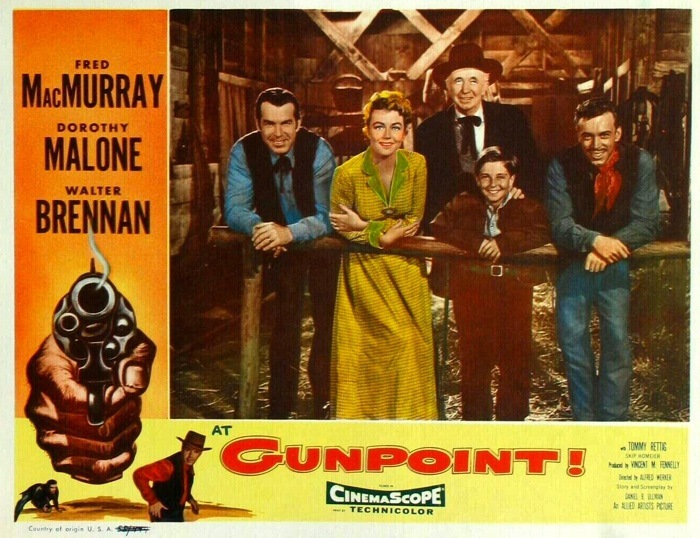 At Gunpoint (1955) from Allied Artists boasts another great cast: MacMurray, Walter Brennan, Dorothy Malone and Skip Homeier. Another one that screams for a widescreen transfer. It’s showtime! While he had his own ranch (now a vineyard), it’s said that MacMurray didn’t like all the riding these pictures required. But he did quite a few of them in the late 50s and plays quite well in a Western. A Good Day For A Hanging (1958), which is available on DVD, is well worth seeking out. 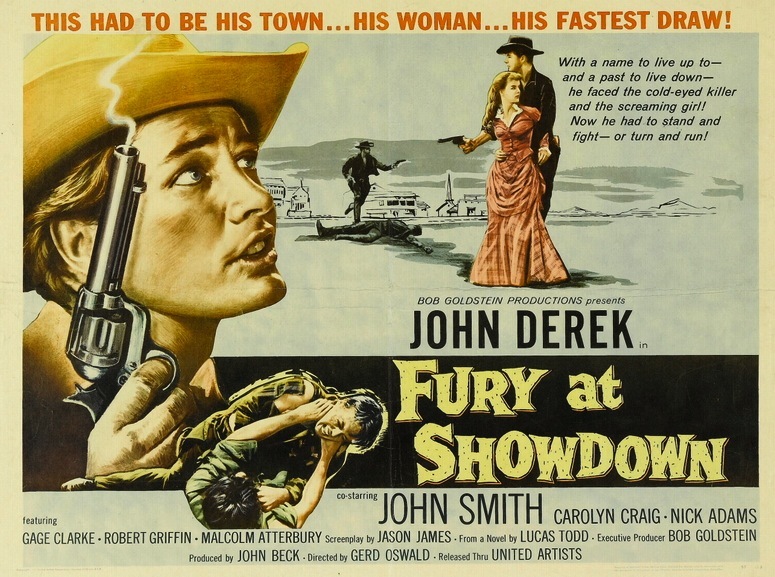 Hulu’s offering up a 1957 Western starring John Derek, Fury At Showdown. Director Gerd Oswald performs a minor miracle here, since this cool little picture was shot in a week. His credits also include A Kiss Before Dying (1956), Crime Of Passion (1957, an excellent film noir starring Barbara Stanwyck and Sterling Hayden) and tons of TV: Star Trek, Perry Mason, The Outer Limits, Bonanza, etc. The Director of Photography, Joseph LaShelle, was nominated for a number of Oscars, and won for Laura (1944). LaShelle shot big films (How The West Was Won, 1962) and small films (I Was A Teenage Werewolf, 1957) — color and black and white, flat and ‘Scope and Cinerama — ending his career with a varied and impressive list of credits. When you’ve got a spare 75 minutes, check it out. UPDATE: Hulu has taken down Fury At Showdown, which is a big drag. They don’t get much better than this. One of the movies that got me writing this book. Sorry it’s not widescreen (don’t be fooled by the titles). Lesley Selander began in the film lab back in the Silent days, and enjoyed a career that spanned 40 years and almost 200 films (then there’s tons of TV). His work in series Westerns, from the Hopalong Cassidys to those great Tim Holt pictures for RKO, shows just how good those films could be. They look great and really move. 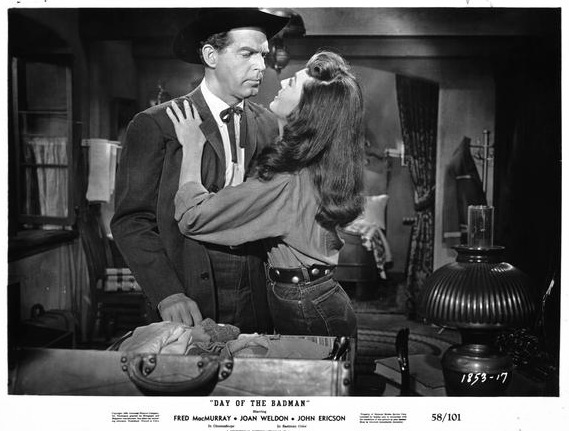 By the mid-50s, the series Western was done, and pros like Selander found themselves looking for something to do. He wound up directing a string of medium-budget Westerns like Tall Man Riding (1955) with Randolph Scott and The Broken Star (1956). His simple style served these films well. The Broken Star stars Howard Duff, has a script by John C. Higgins (Anthony Mann’s Border Incident, 1949) and was shot by William Marguiles (Revolt In The Big House and The Ghost And Mr. Chicken). It runs a brisk 82 minutes.Vodpod videos no longer available.